THE ULTIMATE PARTY KIT Take ShotsClub glass bar decanter set to your next house party, tailgate party, or even a chill kickback. It has everything you need and it's always ready to go. BUY IT TODAY! WHY SHOTSCLUB UNIQUE WHISKEY DECANTER SET? ◆ BE THE COOLEST PERSON AT THE PARTY - Showing up to a party with ShotsClub is better than showing up to a party with chips or a 6-pack. The briefcase alone hints to the crowd that the party is about to be taken to the next level. So when you open it up and show off your guns, everyone will surely want to be a part of the fun that you have to offer! ◆ AN EXPERIENCE TO SHARE - Everyone has their own hobbies and interests. For some it's gun collecting, for others it's whiskey. But we all love to share our interests. ShotsClub merges all of these hobbies so that you can create unique and fun times. ◆ A TRULY UNIQUE GIFT - for yourself, a friend, or a family member who really appreciates his whiskey. You don't even have to wrap it. It's ready to go as is. ① Add the pourer to the bottle of your favorite whisky, scotch, or liquor. ④ When you're ready for fun, put the pourer in the decanter gun and let the party begin! WHAT ARE YOU WAITING FOR? Bring this custom whiskey decanter set to your next party and share it with your family and friends. BE THE LIFE OF THE PARTY: With the ShotsClub drinking party kit, add a special touch by serving alcohol from this unique gun-shaped decanter and pourer. Equipped with everything you need to entertain, your friends will be talking about our one-of-a-kind whiskey decanter set long after the party has stopped. THE COMPLETE PARTY KIT:. 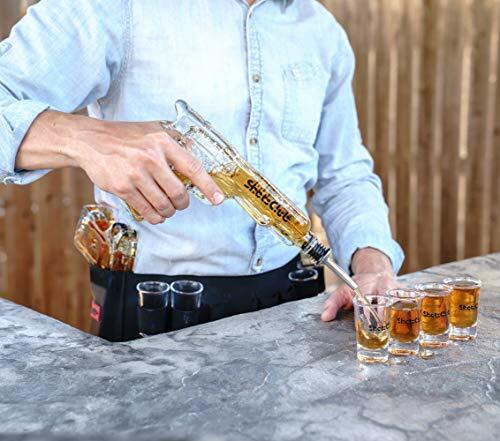 With your purchase of the ShotGun Liquor Kit, you receive: 2 whiskey decanters (shaped like a gun), 8 standard shot glasses, and a belt holster to accommodate all of your drinking supplies. BRING THE PARTY ON THE ROAD: This unique, fun liquor decanter accessories kit come furnished in a protective carrying case that lends itself to a 007 James Bond feel. Not only is this Shotgun Glassware Set practical - it also makes you look pretty badass. THE PERFECT PARTY ADDITION: Our gun decanter and shot glass collection is meant to elevate any party or celebration. It's the perfect addition to a bachelor, graduation, college, engagement, or Christmas party. It even makes a cute addition for a wedding - particularly if it's a Shotgun wedding! GREAT QUALITY: While the design of this kit is meant to be cheeky and fun, don't let that fool you on the quality. Derived from thick, durable, food-grade glass - each of these drinking pieces is chip-resistant and shatter-resistant and will promise long-lasting use and entertainment. If you have any questions about this product by ShotsClub, contact us by completing and submitting the form below. If you are looking for a specif part number, please include it with your message.